The image of a girl flying out the door with goals to fulfill seems to be a glamorous one. With an unwavering purpose, she knows what needs to be done, and goes and does it. And quite often, my mind pictures her in the most fabulous of outfits and the most confident of strides. I like to think that I’ve managed to acquire some secrets after seeing that oft-repeated daydream! And I’ve found that there is one item that I can throw on in seconds and still look perfectly respectable. This wardrobe staple (if you hadn’t guessed by the title) is the trench coat. This classic wear-with-anything coat is perfect for two seasons (spring and autumn) and can come in handy on certain summer days and even mild winter ones. It can be dressed up or down, worn with dresses, skirts, slacks or jeans, and can come with you to the office or even a wedding party. And unlike a dress, a trench coat is like a chameleon. No matter your sartorial tastes, be it sporty or girly, the trench coat can assume and adapt to your inclinations and needs. That’s quite the wardrobe staple! 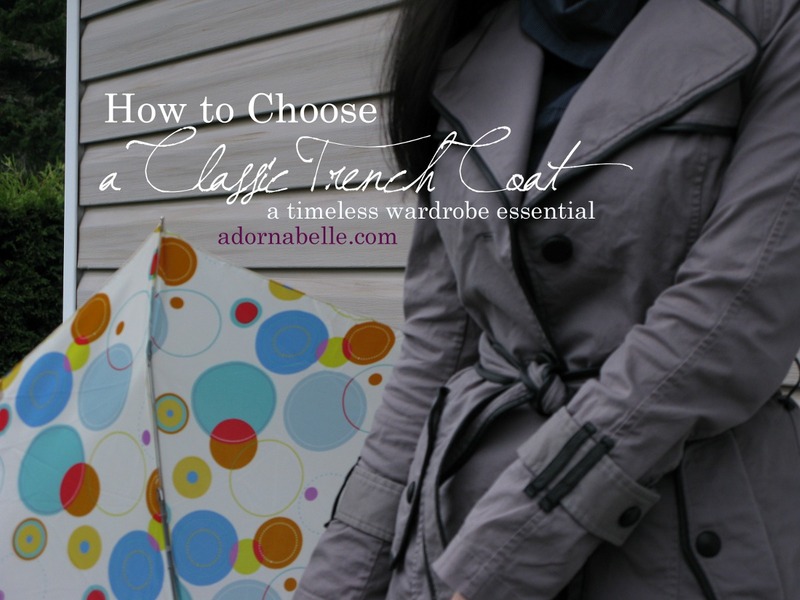 If you’re petite, try to go for a trench that lands mid-way past the hips, or at least above the knees. Very few people can pull off a longer trench coat. However, do try it out anyway to see if you are one of the lucky few! Shoulder details such as epaulets can widen the appearance of shoulders, so keep that in mind when shopping. If you are blessed with a bosom, be careful of double-breasted button detailing and button placements! There’s absolutely no need to go out and spend $200+ on a coat if you’d rather not. However, be sure to pay attention to details, such as: the stitching (no fraying ends, crooked stitches, pull the fabric at the seams to see if it is sturdy), the lining (say no to shabby looking linings! ), the material (go for cotton/cotton-blend as much as possible), and the buttons (the right buttons make a coat look like it is higher quality). Details are what make things look like you paid more for them! A neutral-coloured trench coat is always easy to pair, but don’t let that stop you from trying colourful ones! Sometimes a bright and cheery colour on the outside can make you glow. Just keep the rest of the outfit a bit more understated to let the coat stand out. this reason, I’m going to refrain from naming stores. The brand doesn’t really matter as much as getting a coat you love for a price you can afford. Just remember to keep an eye out for a coat that fits you well and is a good quality while you shop. Sooner or later, you’ll find one you love! Catherine Madeleine (Cathie Maud) has an insatiable appetite for adventure and books. Intrigued by the softer, rose-coloured side of life, she hopes to share romance, joy, beauty and fashion with everyone on her blog MissCathie.com and wherever else she scribbles.